Delta International manufacturing Pressed, Machine Components and Fabricated Assembly for leading companies from the automobile power and consumer good sectors "Team DELTA" consists of qualified professionals with many years of experience in area like fabrication, Material handling and pressed components. Since its inception in 1992. DELTA INTERNATIONAL. has been providing world-class products to various sectors of the industry. It has achieved high level of customer satisfaction by employing a highly component workforce and delivering high quality products at affordable rates. 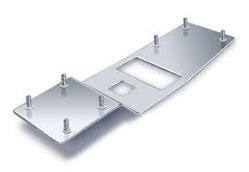 Looking for Sheet Metal Parts ?